How sweet!! I love those! thanks for sharing! 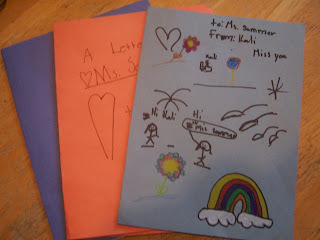 Letters and notes from the kiddos, whether current or past are so special! That is so sweet!! I found your blog via the sellers forum on TPT. I'm your newest blog follower and I'm also following your TPT store. :) I'd be over-the-moon if you'd pop over to my blog! How wonderful that you gave those kids such lovely Kindergarten memories to carry with them! So sweet!! I bet those letters will be something you will cherish forever! OMG, that just warms your heart, doesn't it? Hang on to those cards for one of those days when you really need the reminder of what it's all about. Thanks for sharing the smiles!